Don’t eat to much Bananas! Banana is one of the worlds most eaten fruits and is perfect to help you with Aging slower, but don’t eat to much bananas! A Banana contains high levels of Vitamin C, Manganese and B-6. But to fit in a healthy lifestyle we would suggest just to eat half a banana daily, instead of one. Let us tell you why. Just like any other fruit, Bananas contain fructose. Their relative high concentration of fructose-sugar in comparison to other fruits is quite high. And to much sugar is not good for your skin. 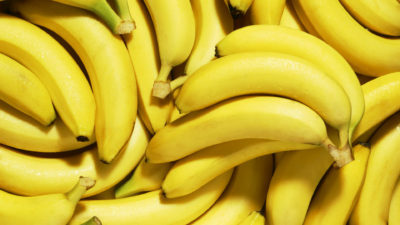 BestAnti-Aging.com advices to just eat half of a banana daily to get exactly enough vitamins of the Banana. Of course we would advice to eat more fruits a day to get all the right vitamins. But why are bananas a great fruit when it comes down to again? Bananas are packed with Vitamin B, B6 in particular. Vitamin B3 and vitamin B6 are the main source of anti-aging vitamins for women. Vitamin B3 helps the body to convert calories from fat, carbohydrates and proteins into energy. It also helps regulate the digestive system and promotes healthy nerves. While vitamin B6 increases the brain and stimulates cell renewal and healthy cells. Bananas an unique mix of vitamins, minerals, and low glycemic carbohydrates in bananas has made them a favorite fruit among endurance athletes. Don’t trow the skin away, because The skin of a banana is perfect to treat acne with.